If your Yammer network is eligible, you can use Office 365 connected groups in Yammer. 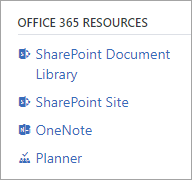 Access Office 365 services, including a SharePoint Online team site and document library, a OneNote notebook, a plan in Planner, from within Yammer. Also includes integration with Power BI and Stream. Edit group membership from various apps. Changes to membership made in one Office 365 app apply to other Office 365 apps. See the group in the Global Address List (GAL) in Outlook. You must enforce Office 365 identity for Yammer users. When you first enforce Office 365 identity there is a seven-day trial period, after which the Status of your Office 365 Identity Enforcement changes to Committed. Your Yammer network must be in a 1:1 network configuration. This means you have one Yammer network that is associated with one Office 365 tenant. This is required as of October 16, 2018. For more information, see FAQ: Consolidating multiple Yammer networks. In the Office 365 Connected Yammer Groups section, the Status for your network will change to Enabled. Any new groups created in Yammer that are eligible will automatically be created as Office 365 connected groups. After about 1 week, existing eligible groups will be converted to Office 365 groups. The group owner must have Office 365 group creation privileges. By default, all Office 365 users have this privilege. The group must be a public or private internal group. Unlisted private groups and external groups can't be Office 365 connected groups. The group must have an owner, and it must have members. When you create an Office 365 connected group from Yammer, in addition to your regular Yammer group features, the new Office 365 group is created, and a new SharePoint site and document library, OneNote notebook, and Planner are created for the group. These resources can be accessed from the Yammer group page in Yammer. If your network has the Yammer files stored in SharePoint feature that began rollout in December 2018, new files added to the group are stored in SharePoint. To see where Yammer files are stored for your network, go to How do I tell where my Yammer files are stored? If you create an Office 365 group from any other app such as Outlook, it will not include Yammer. To have the connected group include Yammer, you must create the group in Yammer. In a connected group set up from Yammer, you can have group conversations in Yammer or in Outlook. You can send an email to a group in Yammer and it will appear in the group's Yammer messages, or use the group's name from the Outlook global address list (GAL) to send email to the group that goes directly to Outlook. Your company can continue to use groups in Yammer and groups in Outlook based on which group type better fits the scenario for a team. Email notifications for Yammer messages may be sent to users depending on the preferences that they have set in their Yammer notification settings. This applies both to connected and non-connected groups. Yammer's integration with Office 365 Groups started in 2017. Subsequent phases will address remaining groups types and deliver integration with Outlook calendar and enhancements for SharePoint and Planner. The best place to stay informed of change management is to follow the Yammer updates on the Microsoft 365 Roadmap. Q: I'm an admin, how do I know if my Yammer network is configured correctly and eligible for Office 365 connected Yammer groups? A: In the Yammer admin center, go to Network Admin > Security Settings. In the Office 365 Connected Yammer Groups section, the status for your network will show as Enabled. Q: Can I disable Office 365 Yammer connected groups? A: No, but you can Manage who can create Office 365 Groups. These restrictions do not apply to tenant admins. Q: If I restrict who can create Office 365 groups for my tenant, will the groups that restricted users create in Yammer be Office 365 connected? A: No. Groups created by people who you have restricted from creating Office 365 groups will not be Office 365 connected. Q: If I have multiple Yammer networks that are mapped to Office 365, will the Office 365 connected Yammer groups work? A: No. 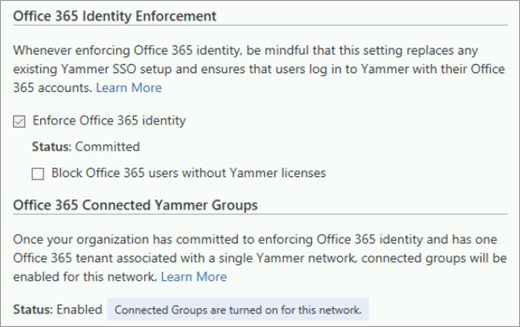 The Office 365 connected Yammer groups experience will work only for Office 365 tenant that is associated with a single Yammer network. See Network migration: Consolidate multiple Yammer networks for information on how to consolidate your Yammer networks. This is required for all Yammer networks as of October 16, 2018. Q: I don't want my existing groups to get connected to Office 365. Can I turn this off? A: No, but you can Manage who can create Office 365 Groups which will also apply to the conversion of existing groups. Only groups owned by users with group creation privileges will be connected to Office 365. If you apply new a creation policy, this will not retroactively change groups that are already connected to Office 365. This will only impact new groups moving forward. Q: What kinds of Yammer groups can be Office 365 connected Yammer groups? A: Currently, only private and public internal groups can be connected groups. External groups and private-unlisted groups will be included in a later wave. Q: Can I make my Office 365 connected Yammer group private and not list it in the Group Directory (secret)? A: No. That setting is not available for Office 365 connected Yammer groups. Q: Can I use an existing group or SharePoint site for an Office 365 connected Yammer group? A: No, a new group and resources specific to that new group are created when you create an Office 365 connected group in Yammer. You can't connect a new Yammer group to an existing Office 365 group, an existing SharePoint site or SharePoint document library, or an existing OneNote notebook. Q: Can I hide an Office 365 connected group from the Global Address Book? For more information about Set-UnifiedGroup, see Set-UnifiedGroup. Q: Where can I create Office 365 connected Yammer groups? A: Office 365 connected Yammer groups can only be created in Yammer. Office 365 groups created in other locations do not include a Yammer group. Q: Can I create an Office 365 connected Yammer group from the Microsoft 365 admin center? A: No, this will be added in later waves. However, for Office 365 connected Yammer groups, you can manage members and delete groups from the Microsoft 365 admin center. Metadata updates can also be applied to groups from the admin center. Q: Can I add external users to Office 365 connected Yammer groups? A: No. This will cause a sync failure because external users are not managed by Azure AD. Q: How many members can my group have? Q: What happens if I delete an Office 365 connected Yammer group? A: All the associated Office 365 content associated with the group is deleted. This includes the document library, OneNote notebook and Planner plans. These resources are soft-deleted, and can be restored by your administrator for up to 30 days. For more information about deleting a group, see Delete a group in Yammer. A: Yes. Any Office 365 connected Yammer group can be converted to dynamic membership. See Create a dynamic group for requirements and limitations. Q: In a connected group, I see there are Yammer Files and a SharePoint Online Doc Library, are these the same thing? A: No, these are separate locations to store files but the members of the group have access to both locations. Files attached to Yammer messages or uploaded in a Yammer Files page are stored in Yammer cloud storage, and files uploaded directly to the groups SharePoint document library are stored in SharePoint. We recommend storing content that needs the structure and management capabilities of SharePoint in the group document library. For easy, quick sharing of images and documents, or to stream videos in Yammer, we recommend continuing to use the default Yammer cloud storage. As of December 2018, we are in process of rolling out Yammer files stored in SharePoint. When your network gets this new feature, new files uploaded to Yammer are stored in the group's SharePoint document library in the Apps/Yammer folder. Any files uploaded before your network gets this new feature remain in Yammer cloud storage. To see where Yammer files are stored for your network, go to How do I tell where my Yammer files are stored? Q: Do my Office 365 connected Yammer groups follow my Office 365 group naming policy? A: Yes. Any new group created in Yammer will add the prefix and suffix from the group naming policy, and will not allow blocked words in the group name. For more information, see Office 365 Groups naming policy. Q: Only some of my groups were converted to Office 365 groups. How do I get the rest of them converted? When the automated conversion happened, it didn't convert groups that didn't meet the eligibility criteria. You can make the needed changes to make those groups eligible, and then create a support ticket to get them converted. Make sure all groups have an owner, and the owners all have Office 365 group creation privileges. Make sure all groups have members. If you have unlisted (secret) groups, change them to private or public groups. To find this information, you can do a data export and look in the groups.csv file. You'll need to cross-reference the owner list with the list of people who have Office 365 group creation privileges.